I’ve mentioned several times that I’ve been trying the Knook from Leisure Arts. I was provided a The Knook Value Pack and Cozy Knits with the Knook book, for free at my request. I’ve been working with it for awhile. I think I got my items at the end of September or the beginning of October. I’ve used them multiple times a week since. I’ve been working hard to really bring the best, most thorough Knook review that I can. The hooks in this particular kit are plastic, and not the most impressive quality of plastic, BUT it is an amazing value for what you get. There are also very nice bamboo Knooks available, usually much cheaper than Bamboo Crochet hooks. I’ve heard they are quite lovely! I also expected the hooks to have instructions and they didn’t. Which was my own fault. There are several beginner kits with instructions and patterns. Between my book and hook choices, I ended up needing tutorial videos. Leisure Arts DOES have free tutorial videos to guide you every step of the way. The stitches were easy to master. The Knit stitch is a bit awkward, BUT I was able to do both it and the purl stitch within one sitting of playing with it and watching tutorial videos. I found the key component- the cord, to be VERY fiddly and awkward to deal with. The biggest part of the learning curve was just getting used to the cord. The actual projects, however, I could not complete one to save my life. I started out trying to make a basic square of worsted weight cotton, just to test the stitches. I’ve mentioned many times I often make a dishcloth/washcloth when learning something new, it gives you something usable for your time at least. I worked and was doing the proper stitches, but found that as I went on the gauge got looser and looser. I said user error and went down a hook size or two to try again. Still couldn’t really get it to work. The worsted weight yarn just did not seem to work with the method, at least for me as a beginner. I also found the cord to be very fiddly. You have to move the cord at the end of every row, where with knitting or crochet you just turn it and keep going. I decided maybe it was best to learn with an actual pattern, so I chose the hat from the book. I had the worst trouble with the cord for this project. SO bad that I wrote the company asking for tips and help. No matter what I did the cord would pull out of the hook, without me even trying to move the cord, sometimes as often as every few stitches. I decided maybe it was because the hat was in the round, so I tried making it flat (can always seam it later) but had the same problem! The company responded VERY quickly with tips, links to blog posts and videos, and was very helpful. I still didn’t really understand what I was doing wrong, but after the tips and advice, I started to have better luck. I had given up on the hat but moved on to the slipper socks in the book. I was making some real progress! Getting several inches going! When working in the round you have to move the cord every few inches to stop it from running out while going around and around. The cord is much less fiddly in the round than it is working flat. I noticed though that somehow I kept dropping stitches! Now, not to brag, but in regular knitting, I almost never drop a stitch. It’s some weird luck I was born with I guess but I can not think of a single time that I dropped a stitch. The Knook cord is supposed to prevent dropped stitches, but here I was somehow dropping stitches! Again my project gauge seemed to change as time went on, but I think that was the user, not the method. I kept working and got about 4″ of sock tube, that was quite honestly just FULL of mistakes. After the 4-5″ mark I decided to pull out my attempt and start over because I felt like I was really getting it, and could actually make a good sock I was proud of. So I started over. I’m back into several inches of my second slipper sock attempt, and have dropped at least one stitch BUT have been on guard and caught it quickly without causing larger mistakes. My gauge still seems to vary, which I think would not happen on traditional knitting needles. Here you can see the front and back of my current attempt. As far as I can tell there is only one method to cast on. With actual knitting, you can utilize different cast ons to create a stretchy edge, a tight edge, etc. Crochet has some options as well, though less than knitting. My slipper sock attempt has a very tight top edge because of the cast on method. I think it will be loose enough but wish I had options to make it better. The technique to make the spiral is very easy and mindless though. So kudos for that. I already knit, crochet, (and pretty much every other yarn craft known to man) so I wasn’t expecting such a detailed learning curve. I honestly figured that by now I’d have several complete projects to show you, and have designed a pattern to give you free. That isn’t what happened. A bit humbling really. All in all, would I recommend the Knook? Honestly, I’m not sure. I think it really depends on WHY you want to try it. 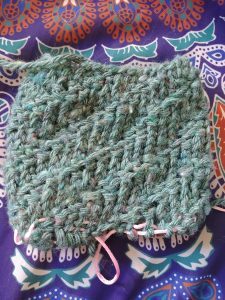 If you want to learn to knit and think the Knook is a good alternative, I’d say “Just learn to knit.” With the variety of tutorials and step by step videos out there you can learn, and all in all it is way easier to learn than the Knook is. Especially, in my opinion, the Continental Method. Leisure Arts has LOTS of knitting patterns and instruction books. Far more than I could ever share here. If you would like to learn to knit I’m also available to help with questions and comments! I love helping my readers master new techniques and get crafty! Just contact me. If you crochet and want a different look then I’d probably suggest learning Tunisian Crochet and giving that a try first. In fact, Leisure Arts HAS some Tunisian Crochet books to get you started. Like this Stitch Guide or this Beginner’s Guide. I’ve also done tutorial videos for several Tunisian Stitches and even led a CAL using Tunisian Crochet. 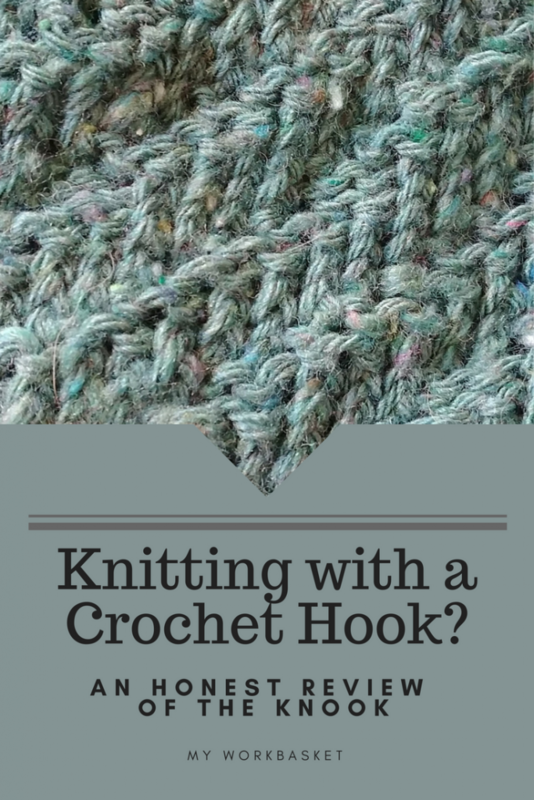 The hooks do also work for regular crochet, so even if you don’t master the Knook you have more crochet hooks in your stash. I am hoping to try a Knook pattern and see if it will work for traditional knitting, but haven’t yet. The kits are pretty affordable, especially with a coupon at the craft store. I’ve also heard of people simply tieing a knot at the end of the cord and using it for Tunisian Crochet. All said and done, in the time I’ve spent with the Knook I could have easily finished one or more similar projects with knitting or crochet. Honestly, I love Leisure Arts, they are a classic name in crafts, especially yarn crafts, and I’ve been using their books and patterns most of my life. I’d usually recommend their products even sight unseen, but this Knook, it’s a bit more complicated. I will say that the Leisure Arts support is amazing and if you struggle they will do their best to help. So if you decide to try it at least you have some backup. Have you thought about trying the Knook? Have you ever even seen the Knook? Have you tried the Knook? I’d love to hear from you! Comment below to tell me your tale, or use the contact form. Full Disclosure- I was given my Knook supplies for free. As you can see it didn’t affect my review. I am also an affiliate for Leisure Arts and will receive a small commission (at no cost to you) if you purchase from them following any of my links. I found a pattern book for the knook for dishcloths that is really easy. You should give that a try. 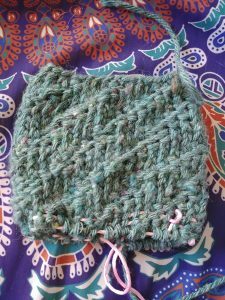 I like going back and forth with the knook and knitting because I often have to go through security and knitting needles are not allowed. I did try a washcloth (there is one in the Cozy Knits book I got) without too much success, BUT now that I have the general technique down I’m not giving up! I didn’t think about Knook and security, that’s a good point. I love gadgets, and pretty much everything crafty, so this isn’t the last time I’ll be picking up my Knook. When the knook first came out I read about the technique and thought what’s the point. It seems much harder to use a string as a second knitting needle to do a project. And after reading your review I still think so.